Alright so before anyone gets bent out of shape or overly offended, please remember that God invented humor too. The Jewish people would have asked him to follow his people out of Egypt instead of leading them. Who wants to see that old of guy in spandex. 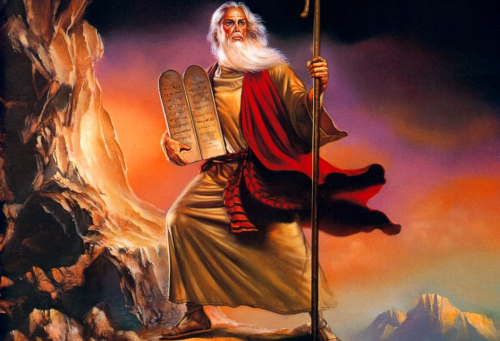 Moses wouldn't have bothered parting the Red Sea, he would have dove in and lead the pack for the worlds first triathlon. 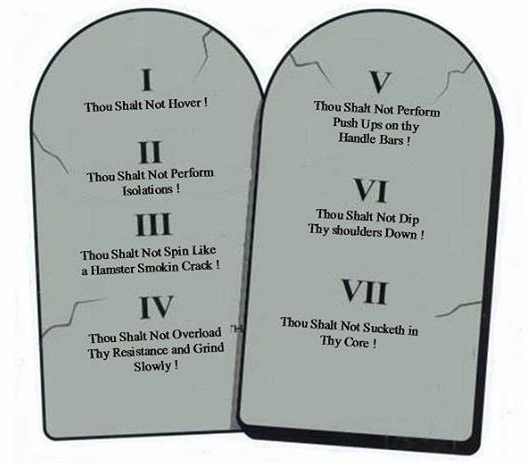 When he came down from the mountain with the 10 Commandments, he would have also come down with 2 more tablets showing the Seven Deadly Sins of Spinning®. Thou Shalt Not Hover! It doth not work thy glutes, it doth not mimic mountain biking, but you shall be cursed with an aching back! Thou Shalt Not Perform Isolations! This move offends thy knees and helps not in strengthening. The burn you feel is from the Devil himself and makes you no faster, no stronger, no cooler and no wiser! Thou Shalt Not Spin Like a Hamster who Smoketh Crack! Super high cadence with little or no resistance will surely causeth thy Lady Parts (or thy Boy Bits) to feel as if they are being scourged by demons! Lo, though some sinners think they looketh cool with feet that fly like angels on gossamer wings, they surely will burn from the fires below (if thou know what I mean). Thou Shalt Not Overload thy Resistance and Grind Slowly! Do not burden my peoples with an overload of Resistance that would surely cause them to have to strain and clutcheth the handlebars. They will surely suffer from multitudes of joint problems. Thou Shalt Not Perform Push Ups on thy Handle Bars! This doth not work thy Pecs and doth surely decrease the number of teeth in thy head if thou slip. Thou Shalt Not Dip Thy Shoulders Down! Cornering or contrived upper body movement doth nothing to improveth thy upper body and doth taketh away from the true aerobic training of Spinning®. Thou Shalt Not Sucketh in Thy Core! Thy core shall remain supple and thy people shall be commanded to do deep diaphramatic breathing. Thou shalt work thy core in Pilates Classes. The Seven Deadly Sins of Spinning® is a satirical perspective on what NOT to do in an indoor cycling class created by Juliet Underill and posted on the Pedal-On forum. I came across the listing of The Seven Deadly Sins of Spinning® a few years ago and created a post for my local gym to remind several instructors why we don't do several moves. Every once and awhile I find that I have to bring them back out, dust them off and repost them. Most recently I had a client ask me what the point of "hovers" were because they made her back ache. I then had to point out that I never coach that move and why. Hovers specifically causes your isolated body to wage a war with the bike. All that kinetic energy of the bike has to be absorbed somewhere and if you're isolated in a hover, then either your knees or your back is going to take it. In a war with the bike your body is going to lose. I believe the reason instructors come up with these movements is one of two reasons, the first being they saw some other instructor using them so they thought they'd add them to their repertoire of moves. 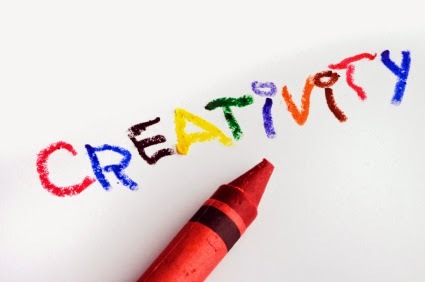 The second reason is that some instructors are looking for a way to be creative and thereby popular. My suggestion, be creative in the profile design; mimic and actual terrain profile, search out new and interesting music, come up with new motivational speak. Whatever you do, remember that you're viewed as the expert with the knowledge of how to do this thing we call Spinning® and how to do it safely.